The play that occurs in cats with behavioral problems may differ from that which occurs in dogs. However, determining exactly how it differs can be challenging thanks to differences in canine and feline behavioral evolution as well as in the evolution of the human-canine and human-feline bonds. Although all veterinary practitioners and a significant number of cat owners recognize the hazards of medically treating cats like little dogs, comparable awareness regarding differences in species behavior may vary from person to person. Tendencies to take a convenient, one-size-fits-all approach regarding domestic canine and feline behaviors may further complicate matters. For example, domestic dogs often are described as members of a social species whereas traditionally domestic cats are perceived as members of is a solitary one. However, both species possess individuals whose behavior spans the full spectrum of sociability. We need only look at the rogues' gallery of negative feline behaviors (e.g., marking and aggression) that occur in response to the presence of other cats living in a wide variety of environments as proof of these felines’ more solitary natures. Similarly, while dogs are more apt to seek out their owners when they’re frightened or not feeling well, cats may hide under the bed or porch. At the same time, though, many communities boast “cat ladies” whose multiple cats live in perfect harmony. But what does this have to do with feline play? Although the Victorian notion that only young animals play and then only to develop adult survival skills has faded, the fact remains that many of the basic behavioral elements that occur in feline play with people do mimic those in the feline predatory sequence. Part of this could be because many people engage cats in play that elicits such responses. These behaviors include stalking, pouncing, pinioning with paws, and holding with teeth. The primary difference between Fluff’s play and predation is the amount force he puts behind his teeth and claws. And that, in turn, is influenced by the amount of stimulus generated by the target or the environment during this process: the more stimulus, the more energy put into the display. Not surprisingly, this predilection may lead to problem behaviors. This probably happens unwittingly because many people don’t know — or don’t want to know — how deeply entrenched predatory behavior may be in their cats. However, failure to recognize this may result in painful bites or scratches that upset owners who only want to play with their cats. If those people react angrily and lash out at the cat, that’s likely to cause the cat to become more aggressive rather than retreat. Either way, the deterioration in human-feline trust that often accompanies these breakdowns in human-feline communication may require time and commitment to resolve. Although some kittens and cats may give a play bow, many more do not. Part of this could be because much of their play involves exploring their territories. This includes climbing up objects or cramming themselves into small spaces no canine would attempt. These displays of seemingly reckless curiosity probably reflect elements of the deeply entrenched survival benefits the skills developed during this play conferred on solitary, territorial and nocturnal predators of small prey who also are prey for larger predators. 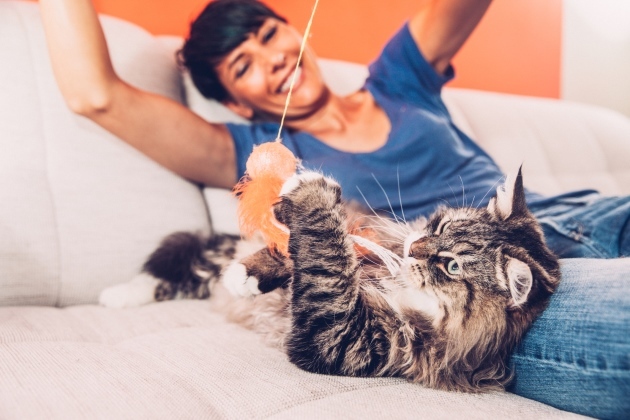 However, these same play behaviors may prove highly disconcerting to owners who envision cat play occurring during specific times, involving specific toys, and specific interactions with those people, à la the family dog. For those who never lived with an active kitten before, high-energy periods of feline playful exploration may be nerve-wracking rather than enjoyable. As one frazzled client put it, "It’s like he’s either totally on and climbing all over me and getting into everything, or sound asleep. There’s no middle ground." Those familiar with kitten play will recognize this as normal play behavior. Nonetheless, it can become problematic if it violates owners’ ideas of "normal" cat play enough to undermine the relationship. Similarly, discovering that their newly adopted street cat adheres to nocturnal time and only feels relaxed enough to play when the owners are sleeping often doesn’t go over well either. Especially when the play involves knocking objects off shelves or playing hockey with their keys. In my experience, true cat folks tend to cut their cats more slack than dogowners when feline play crosses the line. While they may not like what the cat does and respond angrily in the moment, they’re much more open to learning how the debacle came about. This occurs because these people often are attracted to cats because they consider cats different and even mysterious. Compare this to dog owners who often assume they know a lot more about canine behavior than they actually do. But notice I described these cat folks as "true" cat folks. People who get a cat for the kids, inherit the cat from someone who moved, gained one with the new partner or housemate, rescued one of unknown history they expect to reward them with impeccable behavior, or think cats are little dogs, may lack interest in the whys of any problem feline behavior. When this is the case, problematic play-related behaviors may be taken personally and used as a reason to physically punish or rehome the cat. Finally, orphan kittens raised by humans, or those genetically and epigenetically primed to survive in free-roaming self-supporting rather than pet households, taken away from the queen prematurely, or exposed to other traumatic early environments may experience all kinds of aberrant or maladaptive play behaviors. Most of these fall into one of two broad groups. Some cats start out playing with people or other animals normally, but then — and sometimes suddenly — trade in faux predatory play for the real deal with claws unsheathed and teeth in puncture rather than gentle hold mode. Those in another group always play rough because they never learned to play properly. If these cats wind up with people who are afraid to play with them lest the cat scratch or bite them, they may move erratically and otherwise inadvertently intensify this overstimulated feline response. When dealing with any companion animal patient, it always pays to incorporate questions regarding the animal’s behavior into the basic examination protocol. Don’t assume that because the cat tries to or actually clamps onto your or your tech’s arm with teeth and claws means that the cat does this at home, too. But conversely, don’t assume that because the cat is angelic with you and your staff means he’s a little sweetheart at home. Like dogs, cats also set limits regarding the circumstances that will lower the stimulus threshold that separates what most of us consider normal playful behavior from a potentially harmful offensive or defensive display. Some people are tolerant of rougher play — and even encourage it — compared to others. If we don’t ask, we can’t know this and address any problems before they destroy the human-feline relationship.